During the summer, ghost stories are shared by students at elementary and middle schools throughout Japan. Many of these stories use schools as the backdrop, and this sometimes causes a small panic to erupt in the classroom. School ghost stories have been around for quite some time, but they show no signs of falling out of fashion. Here are a few examples of these tales. A pupil returns to her elementary school to retrieve something she had forgotten. She climbs a staircase with 13 steps, but when she counts the steps again the next day, there are only 12. A boy drowns while swimming in the third lane of the school's pool. Since then, those who swim in that lane feel their legs being tugged at by someone. A man with a pale face is said to stand by the door to the school bathroom. When students enter he asks them, "Do you want a red cloak or a blue cloak?" Those who answer "red" are stabbed and die in a pool of blood, and those who say "blue" get the blood sucked out of them and die blue-faced. A clown is said to appear in one of the school building's basement classrooms. Those who see the clown must leave the room within 20 seconds or they will be killed. In 1985 Toru Tsunemitsu, then a middle school teacher, was inspired to compile stories, rumors, and gossip that have been traded among city residents. He started by listening to stories from his pupils after school. To his surprise, he was able to compile over 160 stories in the first 10 days. Even more amazing was that the majority of these ghost and mystery stories revolved around schools. Tsunemitsu presented his findings to a magazine and rewrote some of them so they would be easy for children to read. This led to the publication in 1990 of Gakko no Kaidan (School Ghost Stories). This book became a bestseller and ignited a boom of school ghost stories throughout Japan, inspiring kids around the country to test their ingenuity in creating stories of their own. The following year the book was serialized, and to date nine volumes have been published. In 1994 school ghost stories were turned into a television series, and in 1995 they reached the silver screen; the fourth movie in the series was released this summer. These ghost stories are of course not based on actual events, but they nonetheless give kids a nice cold sweat that helps them make it through the heat of summer. 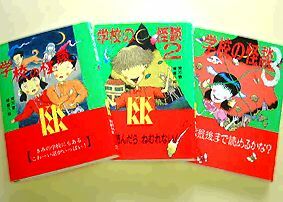 Photo: The first three volumes of Toru Tsunemitsu's Gakko no Kaidan series, published by Kodansha.